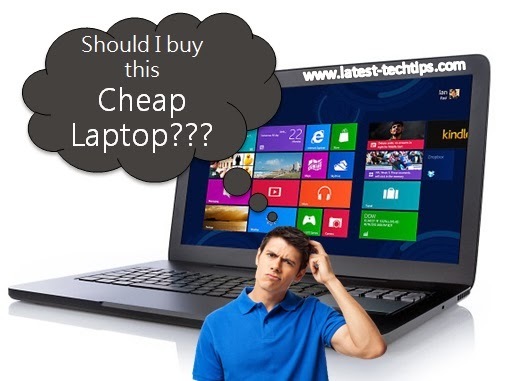 Home Cheap Laptops Laptop Tips A guide to buying a cheap laptop. A guide to buying a cheap laptop. Laptops have been getting a very stiff competition from unusual competitors, yes you guessed it right Tablets. Just few years back nobody had imagined that tablet sales would surpass Laptop sales so soon. But what a Laptop can offer even today is still a lot more than what a Tablet can offer you. A Laptop is still a computer with lot more computation power and if your main focus is producing content and not shelling out lot of money then a cheaper laptop is what you should look for than a tablet. Getting a really good laptop at dirt cheap prices with extra computation power and a good OS is what everyone should look for while buying a cheap laptop. I have listed down some of the guidelines while buying a cheap laptop. Cheap doesn't mean junk and its essential that your laptop should have below basic ingredients even though its a cheap laptop. Pre Installed OS always comes in handy, a laptop which comes with pre installed OS always saves a lot for you. If you buy a cheap Laptop without a pre installed OS you might have to shell out extra $70 - $125 to get it working and your cheap Laptop will become not so cheap. Manufacturers have special deals with OS companies and they get them pre installed at a lot cheaper rates than individually installing them. HP, TOSHIBA, Acer, ASUS are all fairly reputed brands which can offer you good cheaper laptops. Reputed brands help a lot in giving post sales services. Hardware is a very critical aspect of any laptop and having decent hardware is a must in case you want your laptop to perform more than just browsing internet. Processor: Minimum Dual Core of Intel or AMD make is a must. Minimum 1 to 3 years. Minimum rating of 4 stars and above. Customer rating comes from the direct users of these cheap Laptops and if the ratings are good the reliability factor of these Laptops goes up and you can surely think of buying them. If you are satisfied with all the above criteria's then you can surely think of buying that Laptop. Cheap Laptops are easily available online as well as off the shelf. Buying online gives you many more options and gives lot of time to do research.